Sign at the entrance to Muir Woods. Courtesy National Park Service. Source: NPS 2018 NPU (National Park Unit). Rankings among 378 National Park Units. Open year round, including holidays. There is no transportation within the Monument, but transportation to the Monument is available on weekends from late March to October. $3 and up fee from various points in the Golden Gate National Recreation Area and other locations. Summer - Average high temperatures are cool, typically ranging from 60-75 degrees. Winter - Temperate high temperatures are typical, from 50-60 degrees, but can fall to freezing at night. 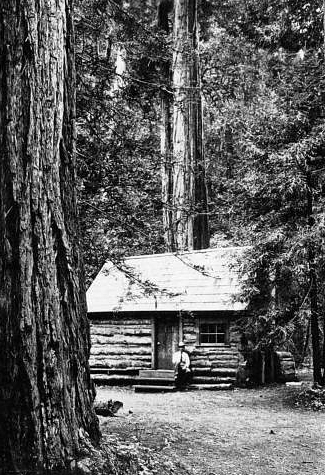 Photo above: The old Muir Woods Cabin, circa 1918. Right: Verdant green example of just one scene in Muir Woods. Both images courtesy of the National Park Service. When you think of California and taking a visit to a collection of large trees, perhaps Muir Woods doesn't come directly, or at least first, to mind. There's Sequoia and Kings Canyon National Park, Yosemite, and Redwood National Park on the first, second, and third line for most. And, for the most part, that's understandable. They're national parks of a much larger kind than the pocket gem eleven miles above the Golden Gate Bridge called Muir Woods. It's true, there's a whole lot of history here before the Muirs and preservationists got involved. There was the Coast Miwok tribe who inhabited the land of the trees for centuries, and later, when development came this way prior to and after the gold rush west of the woods, there was a tourist railroad called Mount Talapais Mill Valley Scenic Railroad who brought the sightseers into the forest. But it was probably the loggers who caused the conservation movement to protect places like Muir Woods as they had taken their toll on the land around the valley of the Redwood Creek, sparing it solely because it was difficult to get to. So Congressman William Kent bought a 611 acre tract in 1905 to protect it, and three years later handed over nearly half of it to the perpetual care of the National Park Service, well, once it was established eight years after that. Muir Woods might even have a bit more historic lore to it than some other more visited sites in the area, although that may be a bit unfair to the others. 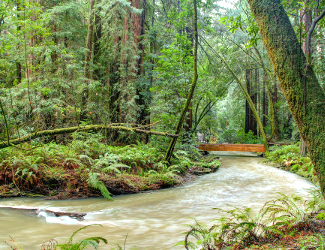 And on a larger note, Muir Woods is part of the Golden Gate Recreation Area, which encompasses a ton of recreation and tourist opportunities, and is, to the surprise of some, one of the highest attendance national park units in the United States. 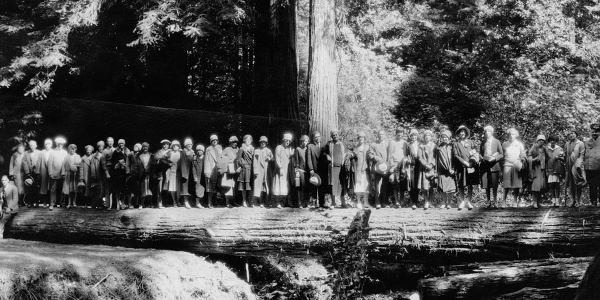 Photo above: Early visitors to Muir Woods, Date Unknown. Courtesy National Park Service. 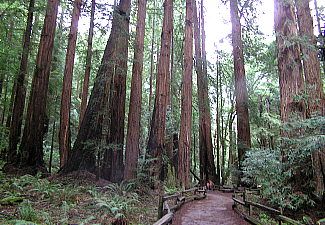 Photo below: View of one walking trail at Muir Woods, 2012, Carol Highsmith Collection. Courtesy Library of Congress. 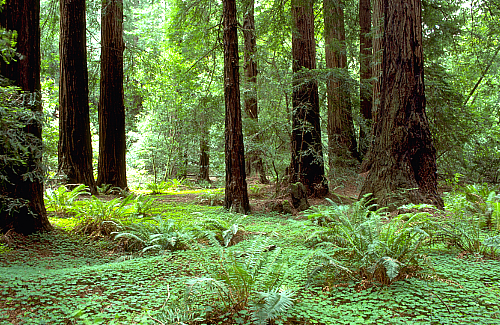 So what will you see when you visit Muir Woods and what is the history associated with it? Well, let's start with what you'll see. A plethora of the largest trees in the world, the coastal redwood, towering over you as you walk through this ecologically cultured park. You can take the walks in a self-guided fashion, with brochure or not, or listen to park rangers on 15 minute talks or 1 hour walks. There are also special walks held each month. Check with the visitor center for the various times and subjects available. Muir Woods can get crowded, but that can be a unique experience on those days when people and nature collide. It's small compared to those other big tree places mentioned above. But it tells a story of ecology and history surrounding the Kents, the Muirs, and the desire of the preservationists to protect this special place and eventually hand it over to the park service in 1908. Teddy Roosevelt was pleased to accept the land that William Kent donated in honor of John Muir on January 9 of that year. 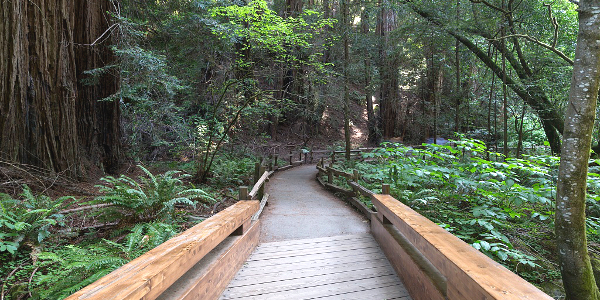 Muir Woods is protected nature personified, all within a well cared for environment with easy to walk paths. Soak it all in. Listen to the quiet. 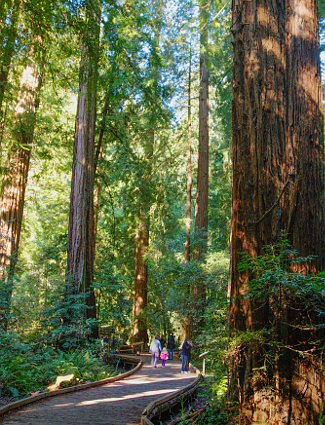 Marvel at the big trees and even the small Convergent Ladybugs that migrate back to the logs and surfaces of Muir Woods every year, plus all of the other flora, fauna, and creatures that soar and slither around each turn. Muir Woods T-Shirts and Souvenirs from the official gear of America's Best History. 1. Take advantage of a ranger led program through the woods or a talk about the park history. At 1 hour, the ranger led hike is a great place to start your first journey through the monument. If you're there during the even more extensive guided hikes, which are plentiful, take advantage of the longer walks if you're able. They take you to even more remote and beautiful places in the park. 2. Have an ecologically friends bite to eat at the Muir Woods Trading Company Cafe inside the visitor center. 3. Don't forget to look up. The view of the trees in these woods just remind us of how small we humans really are. You might have to take a couple Tylenol after the gander, but it will likely be worth it. Photo above: Boardwalk trail amongst the trees at Muir Woods. Courtesy National Park Service/Kirke Wrench. The Muir Woods Visitor Center has info, dioramas, and seasonal displays plus the Muir Woods Trading Company gift shop and cafe. Hiking Trails - There are a variety of hiking trails, all paved or boardwalked at lengths that can meet most needs for a total of six miles within the park borders. You can take the 1/2 hour, 1 hour, or 1 1/2 hour loops or if you like to take longer hikes, some extend into Mount Tamalpais State Park. The trails in Mount Tamalpais are not paved and much more rugged than those in the monument. There isn't a beach inside the Monument, but there is namesake Muir Beach nearby, as well as Stinson Beach. Ask at the Visitor Center how to get there. Photo above: Another trail view at Muir Woods. Courtesy National Park Service. 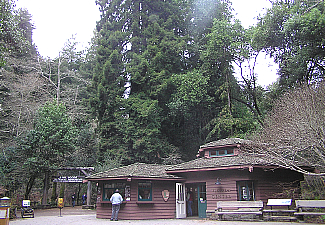 Below: Entrance station to Muir Woods National Monument. Courtesy National Park Service. There's so much to see in this area just outside Muir Woods and more than a few of them should meet the needs of even the most incongruous member of your tourist party. 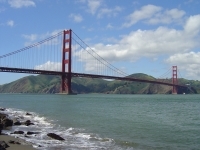 They include forts (Fort Baker, Fort Cronkhite, Fort Munson, Fort Mason, Fort Point); more nature (Marin Headlands, Muir Beach, Muir Beach Overlook, Olema Valley, Stinson Beach, Tennessee Valley, Baker Beach, China Beach, Lands End, Ocean Beach, Milagra Ridge, Mori Point); other historic sites on various subjects (Nike Missile Site, Point Bonita Lighthouse, Alcatraz Island, Cliff House and Sutro Baths, Crissy Field, the Presideo, Pheger Estate, Crissy Field Center). 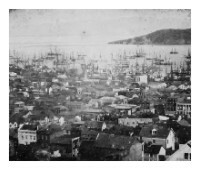 Photo Above: San Francisco during the Gold Rush and Barbary Coast days, 1850. Courtesy Library of Congress. Below: Bridge over Redwood Creek as it makes its way to Muir Beach. Courtesy National Park Service/Kirke Wrench. 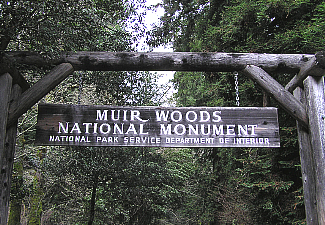 There are no lodging or comping options inside Muir Woods National Monument. You can camp in the Golden Gate Recreation Area or the Mount Tamalpais State Park next door. Nearest place to camp is just north of the park near the Pantoll Ranger Station. Other parks nearby with camping facilities include China Camp State Park, Angel Island State Park, Samuel P. Taylor State Park, and Point Reyes National Seashore. There are also other private campgrounds nearby as well. For lodging of the less natural kinds, hotels and motels within thirty minutes are available in Marin County towns of Mill Valley, Sausilito, Corte Madera, Larkspur. San Rafael, and Tiburon. Check at Expedia, for the best option for you. 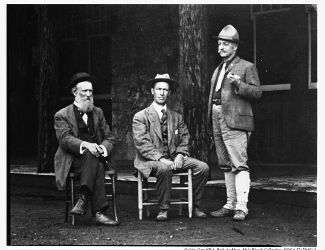 Photo above: John Muir, left, Thomas Kent, and another friend at Muir Woods. Courtesy National Park Service.